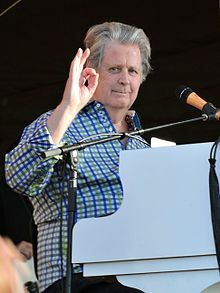 Brian Douglas Wilson (born June 20, 1942) is an American musician, singer, songwriter, and record producer who co-founded the Beach Boys. After signing with Capitol Records in 1962, Wilson wrote or co-wrote more than two dozen Top 40 hits for the group. The Beach Boys were formed by Wilson along with his brothers Carl and Dennis, their cousin Mike Love, and neighborhood friend Al Jardine. Wilson, who grew up influenced by 1950s rock and roll and jazz-based vocal groups, originally functioned as the band's songwriter, producer, co-lead vocalist, bassist, keyboardist, and de facto leader. Wilson was the first pop artist credited for writing, arranging, producing, and performing his own material. He is considered a major innovator in the field of music production, the principal originator of the California Sound, one of the first music producer auteurs, and one of the most famous examples of the outsider musician. Wilson's honors include being inducted into the 1988 Rock and Roll Hall of Fame and winning Grammy Awards for Brian Wilson Presents Smile (2004) and The Smile Sessions (2011). In lists published by Rolling Stone, Wilson ranked 52 for the "100 Greatest Singers of All Time" in 2008 and 12 for the 100 Greatest Songwriters of All Time in 2015.